Increasing dissatisfaction with investor-State dispute settlement has weakened the adversarial approach to international investment law and policy. This article argues that global initiatives, such as the UNCTAD’s Global Action Menu for Investment Facilitation (the “Action Menu”), provide good policy praxis to redirect the development of international investment law from adversarial to a constructive path. The Action Menu suggests rebuilding of future international investment law and policy with a reconciliatory spirit and by promoting investment facilitation for sustainable development. To demystify the Action Menu’s policy praxis, this article addresses the following key questions: How is the Action Menu’s proposed investment facilitation framework different from existing investment promotion and protection strategies? Does the Action Menu propose a fundamental change to existing international investment policy agenda? Are there other comparable initiatives that may enlighten the Action Menu’s approach? To what extent the existing domestic policies on investment facilitation reflect the Action Menu’s approaches? Would the Action Menu’s investment facilitation framework indeed promote sustainable development? The analysis primarily hinges on the impression that at the time when international investment law is fraught with internal antagonism, the Action Menu’s investment facilitation framework brings positive vibes to international investment law and policy making. Key strengths of the Action Menu are its holistic treatment of all primary foreign investment policy stakeholders (i.e., foreign investors and their home and host States) under one policy framework, and its whole-of-government approach for implementation of investment facilitation policies. The apparent weaknesses are a lack of attention to curb possible race to the bottom and visible lapses in offering a collaborative sustainable development programme. The article concludes that although the Action Menu sets out great policy initiatives, there are many issues that remain to be addressed. 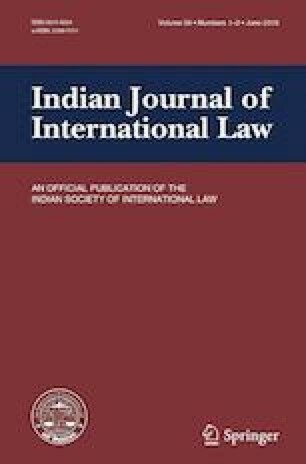 The author would like to thank the reviewers of Indian Journal of International Law for their comments on an earlier draft. More fundamentally, conflicting arbitration awards do not bring about domestic and international policy reform to prevent further disputes. Although overwhelming presence of BITs with starkly similar provisions has manifested conclusions that they transpire as an international legal and policy framework,10 they are essentially bilateral instruments having little rule making significance for non-party States.11 Instead of encouraging the development of multi-stakeholder co-operation leading to a universal policy framework for treatment of foreign investments, BITs are arguably one-sided agreements imposing international minimum standards of treatment for foreign investors on developing countries to which they would not have agreed in a multilateral treaty.12 At domestic level, most existing BITs are essentially passive instruments having no direct application in a State’s national investment policy space. For most BIT party States, BITs remain dormant until a foreign investor initiates a BIT based claim. This is when a BIT is eventually operationalised. The Organisation for Economic Co-operation and Development (OECD) led negotiations on a multilateral agreement on investment (MAI) collapsed in 1998, which has created a vacuum in multilateral investment policy making. At this important junction when policy makers from both capital importing and exporting States are contemplating various options to restructure international investment regime, there is a pressing need to find internationally well-coordinated policy alternatives to maximise the benefits of FDI in a level playing field between home and host States, to promote mutual co-operation rather than competition leading to a race to the bottom, and most importantly, to promote investment in sustainable development. The United Nations Conference on Trade and Development (UNCTAD) has recently published a revised version of its Global Action Menu for Investment Facilitation (the “Action Menu”).13 After the collapse of OECD MAI negotiations, the UNCTAD Action Menu is the first attempt by an international organisation to potentially redirect international investment policy to a more co-ordinated and constructive path as compared to existing proliferated regime composed of several thousand BITs. As compared to BITs, the Action Menu is not meant to be a treaty or a treaty draft, and since investment facilitation essentially falls within a State’s eminent domain, it is primarily meant to promote the adoption of international best practices for national investment policy making. By recommending options for national investment policy, the Action Menu’s provisions are meant to promote the ease of business and prevent the accrual of investor-State disputes.14 These options are not meant to be standalone provisions; they are mutually inclusive suggesting a comprehensive policy framework directed towards the common goal of investment facilitation. The Action Menu’s importance cannot be overstated. First, it is likely to yield a harmonisation effect. The Action Menu’s ultimate objectives of investment facilitation are framed within the preview of well celebrated principles of transparency, predictability, efficiency and accountability.15 The more detailed policy options given in the Action Menu reflect international best practices and their adoption by States would produce State practice leading to the development of internationally recognisable standards. Second, the Action Menu creates a niche for its application by nuancedly distinguishing investment facilitation from investment promotion and protection. This distinction is arguably notional, however, for the purposes of international investment policy making; it serves an important purpose in distinguishing the Action Menu’s objectives from contentious issues of minimum standards of protection and investor-State dispute settlement (ISDS). For dispute resolution, the Action Menu has concentrated primarily on mechanisms to prevent investor-State disputes. In the event of an unavoidable dispute, the Action Menu has proposed resolution through domestic alternative dispute resolution (ADR) systems instead of the supra-national ISDS. The primary idea of this article is to review the Action Menu to identify and analyse its strengths and weaknesses, considering the above stated problems with the current international investment law and policy regime. The article engages with the significant questions that the Action Menu has raised and suggests means to address those questions, namely: What are the objectives of the Action Menu and how does the Action Menu strive to achieve them? Are there any other comparable initiatives that may enlighten the Action Menu’s approach and policy directions? To what extent the existing domestic policies related to investment facilitation reflect the Action Menu’s approaches? Does the Action Menu’s investment facilitation policy framework realistically promote investment in sustainable development? Other matters that the article analyses include the Action Menu’s breadth to embrace all three primary stakeholders (namely, foreign investors and their home and host States) in a single document, its whole-of-government approach towards the implementation of investment facilitation framework, and the issue of primacy of national interest as an obstacle to the Action Menu’s aims. The question whether the Action Menu effectively addresses the problem of race to the bottom and the possible issues concerning the Action Menu’s proposed multi-stakeholder consultation by host States are also discussed. The discussion on investment policy is from a legal angle. The tone is thought-provoking, with a view that the article will open dialogue to investigate and understand the role of investment facilitation policy in the much-needed overhaul of international investment law and policy. The article is structured as follows: Section 2 summarizes the objectives of the Action Menu and highlights the issues that arise from its distinction between investment facilitation and investment promotion. Part 3 places the Action Menu in the context of other similar investment facilitation policy initiatives taken by the Asia-Pacific Economic Cooperation (APEC), the Organisation for Economic Cooperation and Development (OECD), and the World Trade Organisation (WTO). This part analyses differences and similarities in the approach of these international organisations in the implementation of policy framework for investment facilitation. Part 4 investigates the existing domestic investment policies implemented by various States that reflect on the Action Menu’s approach. Part 5 presents a detailed analysis of the selected “Action Lines” of the Action Menu. Part 6 examines the critical role assigned by the Action Menu to domestic investment promotion agencies (IPAs) to implement investment facilitation policies. Part 7 concludes the article by providing a list of proposals that should be included in the Action Menu. The overall conclusions are that although the Action Menu is a step in the right direction, there are many gaps that need to be filled. Foreign investment policy analysists view promotion and facilitation policies as a cost effective means to credibly signal a host State’s intention that it is interested in attracting FDI and improving the business environment for the private sector.17 Although there has been acute competition among capital importing States to strategize investment promotion, no serious initiative existed to develop uniform national policies on investment facilitation.18 The UNCTAD’s Action Menu has filled this gap and, if implemented by States, will likely to increase the FDI flows. The initiative is also very timely because the above discussed concerns regarding the existing FDI regime have seriously obstructed the development of international investment law and policy requiring new thinking for future of domestic and international FDI regulation. Both these initiatives remain primarily concerned with the promotion and protection of foreign investment, whereas the Action Menu is in essence a framework for investment facilitation. The creation of a multilateral investment court is not readily imminent due to the existing divide between capital importing and exporting States over the minimum standards of investment protection. In contrast, the Action Menu does not deal with international minimum standards of investment protection and primarily focuses on a coordinated strategy on domestic reform of investment facilitation policies. Regarding BITs, States are likely to continue redesigning their BIT practice to negotiate better deals that work for both BIT party States. Although the new generation of BITs, such as the BIT between Brazil and India,21 include aspects of investment facilitation, they principally remain mutually negotiated deals between the party States. Because BITs are bilateral deals, it is likely that the BIT practice will remain fragmented. On the other hand, the Action Menu’s proposals are aimed at setting broader policy goals for investment facilitation beneficial for all States that are willing to enhance their domestic regulatory capacity to get most out of foreign investments and prevent investor-States disputes. The Action Menu’s proposals set standards for investment facilitation policies giving States a choice to include them in their future BITs if agreeable to both BIT parties. Investment and business facilitation measures include promotion efforts, provision of incentives to foreign investors, reduction of unnecessary costs of doing business in a host country (e.g., reducing or eliminating corruption and improving administrative efficiency) and provision of amenities that contribute to the quality of life of foreign investors and expatriates. Investment facilitation services are another increasingly important component of promotion activities in both developed and developing countries. Such services consist of counselling, accelerating the various stage of the approval process and providing assistance in obtaining all the permits needed. One [promotion] is about promoting a location as an investment destination (and is therefore often country-specific and competitive in nature), while the other [facilitation] is about making it easier for investors to establish or expand their investments, as well as to conduct their day-to-day business in host countries. The Action Menu’s distinction suggests that investment promotion essentially aims to promote a certain location as an investment destination, which is traditionally achieved by incentives such as tax rebates or creation of special economic zones. Investment facilitation, on the other hand, is concerned with easing investment transactions through domestic regulation on establishment, retention and expansion of investments. Therefore, while investment promotion policies draw the attention of foreign investors in order to invite them into a host State, investment facilitation aims to support the investors that have shown strong interest to invest or have already invested in a host State. The practical significance of the distinction between facilitation and promotion is quite remarkable. Promotion, in its traditional sense, encompasses competition between States to attract more FDI and potentially leads to a race to the bottom, whereas the focus of facilitation is on domestic reform and capacity building. It goes without saying that the outcome of investment facilitation policies will also yield investment promotion as some foreign investors may particularly choose to invest mainly because their reliance is greater on a State’s investment facilitation practices. However, attraction of FDI is not the primary purpose of investment facilitation policy in the first place but could only be a natural outcome of both promotion and facilitation policies. In other words, investment promotion and facilitation policies complement each other, and both remain important factors to attract and retain FDI. In this regard, it is easy to misconstrue the Action Menu’s distinction between investment promotion and investment facilitation. The Action Menu’s investment facilitation framework can be viewed as another means to achieve the objectives intended from the pre-entry model investment treaties. It could be argued, for example, that the distinction is a covert attack on the host States’ regulatory space through swaying the domestic regulation of foreign investments disguised to achieve the objectives of pre-entry investment treaty model. The possibility of such negative views is further supported by the Action Menu’s direct reference that it strives to bridge existing gaps in investment facilitation in the investment treaty practice.33 There is, therefore, a serious need for UNCTAD to clarify that the Action Menu’s focus is on post-entry facilitation only, and it is not meant to influence domestic rules and policies on admission of foreign investment. The application of international minimum standards to govern investor-State relations also leads to controversy over the expansive interpretation of fair and equitable standard, which is included in most international investment agreements (IIAs),37 by ISDS tribunals.38 As compared with binding, yet controversial, international minimum standards, the Action Menu’s guidelines are primarily meant to be implemented by States unilaterally to improve their domestic investment climate. This distinction obviously has significant legal importance as it clarifies that the purpose of the Action Menu’s investment facilitation guidelines is to promote mutual cooperation rather than to impose legal obligations. Accordingly, if investment facilitation provisions are included in IIAs, they should be viewed as distinct from promotion and protection provisions because facilitation is meant to promote mutual cooperation to improve domestic investment climate rather than to create legal obligations based on international minimum standards. Investment facilitation, in the Action Menu’s sense, is meant to make foreign investors’ operations easier, and it can also be argued that facilitating investments is merely a means by which investor protections are operationalised in practice. However, as contemplated above, the existing framework of investment protection is built on the idea of international minimum standard enforced through ISDS tribunals,39 which is primarily operationalised by IIAs, i.e., BITs and investment chapters in free trade agreements (FTAs).40 Whereas investment facilitation is not founded on international minimum standards, the Action Menu segregates investment facilitation from investment protection and takes the focus of international investment policy making away from the contentious standards of protection, effectively diverting the international investment policy agenda to an uncontroversial and constructive direction and creating new policy space in the name of investment facilitation. Similar discussion on conceptualisation of investment facilitation as an independent policy area is gaining momentum in recent years. Hees and Cavalcante, for example, have suggested that the most appropriate way to tackling the investment facilitation concept is by means of a negative list approach, i.e., by clarifying what is outside the scope of facilitation.43 The distinction can, according to Hees and Cavalcante, be simplified by deducing that facilitation does not include market access, investment protection and ISDS.44 This could actually be a useful way to clarify the transformation between distinct yet closely related concepts of facilitation, protection and promotion. While the concept of investment facilitation will evolve and gain broader recognition over time, such negative list approach can helpfully isolate the investment facilitation framework from the disputed areas of international investment law, i.e., ISDS, international minimum standards and market access. There are significant differences between the approaches of UNCTAD’s Action Menu and the APEC’s IFAP. First, the references to ‘all stages of investment cycle’ and ‘broader investment reform efforts’ indicate that the APEC’s IFAP does not maintain a firm distinction between investment facilitation and promotion. This is a significant difference because the IFAP is likely to be viewed as an extension to the existing investment promotion and protection policy framework operating within the troubled waters of currently crisis ridden international investment law. Although the APEC’s IFAP has broadly similar principles set out for investment facilitation as compared with the UNCTAD’s Action Menu, the former specifically aims to complement the existing international efforts to streamline investment facilitation policies.48 On the other hand, as discussed in Part 2 above, the UNCTAD’s Action Menu has effectively distanced itself from the existing controversial aspects of international investment law, such as the ISDS and international minimum standards. Promoting and facilitating investment are two very different types of activities. One is about promoting a country or a region as an investment destination, while the other is about making it easy for investors to establish or expand their existing investments. Effective investment promotion leverages the strong points of a country’s investment environment, highlights profitable investment opportunities and helps to identify local partners. In terms of facilitation, effective one-stop-shops with single-point authority can be a critical factor in investment decisions, especially if they cut down the investor’s transaction costs: complex administrative burdens represent significant barriers to investment. Effective investment facilitation can also reduce corruption risks by decreasing the number of steps involved in the decision-making process. A core mandate of investment facilitation includes filling an information gap created by incoherent or inaccurate policies. Investment facilitation can thus provide investors with much needed clarity vis-à-vis public administration and policies. The OECD’s PFI provides a much clearer distinction between investment promotion and facilitation. The PFI’s approach, contents and coverage also provide an opportunity to analyse, in comparison with the Action Menu, as to what should be the subject matter of a country’s investment facilitation policy. The PFI proposes guidance in twelve policy fields that are critically important for improving the quality of a country’s enabling environment for investment.53 In addition to components of domestic investment policy and investment promotion and facilitation, the PFI’s policy fields include trade, competition, tax, corporate governance, responsible business conduct, human resource development, investment finance, public governance and sustainable investment. The coverage of PFI is, therefore, much broader than the Action Menu, which is strictly limited to investment facilitation. However, instead of the PFI’s approach to provide broader general guidelines, the Action Menu provides pinpoint Action Lines for investment facilitation policy. In doing so, the Action Menu also touches on some of the other areas addressed by PFI, however, remaining only within the purview of investment facilitation. By bringing every aspect of domestic policy relevant to investment facilitation within the pinpoint principles, the Action Menu has not only created investment facilitation policy as a separate field of inquiry but has also clarified its subject matter, scope and coverage taking the investment facilitation agenda further than the OECD’s PFI. These developments at the WTO, although too recent to be fully evaluated in this article, illustrate the significance attained by the investment facilitation as an international investment policy framework that is independent of existing investment promotion and protection regime. The efforts such as APEC’s AFIP, OECD’s PFI and UNCTAD’s Action Menu have provided some clarity to the emerging principles of investment facilitation policy, gradually pushing towards some sort of global consensus on those principles and opening their way to multilateral negotiations at a global platform such as the WTO. It remains to be seen if the WTO would be able provide a viable platform for a multilateral agreement on investment facilitation. The Action Menu adopts two broader system level approaches to influence the domestic investment facilitation policy, namely, the triangular approach and the whole-of-government approach. Secondly, while States typically aim to ensure some form of overall internal economic policy coordination mechanisms among various levels of government across different sectors, most developing countries struggle to implement procedures on consultation and coordination among various policy making institutions and regulatory bodies responsible for developing and implementing detailed investment policies.60 Lack of coordination among layers of government organs has been a major cause of concern for successful formulation and implementation of domestic investment policies,61 which undermines the rule of law giving rise to investor-State disputes. Technical cooperation and other support mechanisms for investment. These key areas undoubtedly constitute the most important pillars of any successful FDI facilitation framework. Complementing investment facilitation by enhancing international cooperation for investment promotion for development, including through provisions in IIAs. These Action Lines clearly provide a wide spectrum of important policy goals to facilitate investments in an effective way. The overall objectives of the 10 Action Lines are primarily to improve transparency and availability of information to investors through efficient administrative procedures to ensure predictability of the policy environment. Lack of transparency in host government actions and inconsistent formation and implementation of investment policies shatters investor confidence and produces investor-State disputes. The Action Line 1 prevents the possibility of disputes due to lack of information by requiring host States to ensure consistent flow of information on investment regime through IPAs and timely notice of changes in procedures, applicable standards, technical regulations and conformance requirements. Likewise, inconsistency amongst various government departments and layers of government in the interpretation and application of investment regulations often triggers investor-State disputes. The Action Line 2 precludes this possibility by requiring consistent application of investment regulations across relevant institutions, avoiding discriminatory use of bureaucratic discretion in the application of laws and regulations on investment, and establishing clear criteria and procedures for administrative decisions with respect to investment screening, appraisal and approval mechanisms. The Action Line 2 further suggests to creating amicable dispute settlement mechanisms, including mediation, to facilitate investment dispute prevention and resolution. Such mechanisms at national level will strengthen domestic institutions, enhance capacity of national policy makers and experts to handle investor-State dispute, and reduce reliance on costly and controversial international arbitration. Similarly, the Action Line 4 emphasises on maintaining mechanisms for regular consultation and effective dialogue between investment policy makers and stakeholders to identify and address issues encountered by investors. It further requires establishing mechanisms providing investors with an opportunity to comment on proposed new laws, regulations and policies or changes to existing ones prior to their implementation. Such regular consultations with investors and the possibility to raise their concerns before new laws and enacted will undoubtedly contribute to prevent disputes. Several other proposals in the Action Menu are aimed at early detection, prevention and amicable resolution of investor-Sate disputes. Actions such as improvement of the standards of corporate governance and responsible business conduct (Action Line 4), establishment of IPAs to address investor complaints and timely action to prevent, manage and resolve disputes (Action Line 5), home-host State consultation with stakeholders throughout the investment life cycle with a view to addressing specific problems raised by investors and prevention of the escalation of investment disputes (Action Line 8) are all directly aimed at investor-State dispute prevention. Other Actions, such as enhancement of the efficiency of administrative procedures (Action Line 6), enhancement of international cooperation on anti-corruption practices in the investment process (Action Line 7), home-host States cooperation to conduct feasibility studies for potential investment projects including environmental and social impact assessments, will also massively contribute to dispute prevention because investor-State disputes mostly arise due to administrative inefficiencies, alleged corruption by government officials and host States’ public policy concerns regarding a foreign investment. Undoubtedly, the Action Lines are all valuable proposals for investment facilitation and investor-State dispute prevention. However, there are several areas that need further clarification, tightening and development. The first three Action Lines emphasise shortening of screening times to ensure procedural and administrative efficiency at various stages of investments. However, shortening the screening and processing times may produce unexpected complications during the life of investments. Although the Action Line 3 does state speeding up in “appropriate situations,”85 it neither clarifies what situations might justify delays in approval nor provides guidelines to mitigate possible harmful outcomes of fast-tracking. Speeding up processing times will surely increase the satisfaction of foreign investors; however, emphasis on investment facilitation should not aim to completely eliminate administrative discretion. It will likely be unacceptable to most States. Effective investment facilitation efforts should support the mobilization and channelling of investment towards sustainable development, including the build-up of productive capacities and critical infrastructure. It should be an integral part of the overall investment policy framework, aimed at maximizing the benefits of investment and minimizing negative side effects. IPAs (or relevant agencies) for the promotion of sustainable-development-focused investments such as green investments and social impact investments. This is by no means a comprehensive treatment of sustainable development goals in the Action Menu. The Action Menu should provide that every investment proposal should contain a detailed statement explaining as to how it will contribute to sustainable development. The Action Menu should make proposals to ensure that appropriate procedures are in place to evaluate the possible positive and negative effects on sustainable development of proposed investments. Additionally, the Action Menu should recommend that the investors’ home States should give their expert input in the evaluation process of the sustainable development aspects of proposed investments. Depending on the nature of a proposed project being long, medium or short term, the sustainable development aspects should be regularly monitored, and any negative aspects are gradually phased out if it is impossible to initiate investment without negative effects on sustainable development. The Action Menu should also promote the idea of enforcement of liability in investors’ home States for any harm caused by the investors to sustainable development in host States. This is particularly useful for developing and least developed host States with poor regulatory and enforcement capacities. This negative investment promotion strategy is also sometimes reciprocated by foreign investors who seek to invest in States with undeveloped public interest regulations and environmental standards.97 Resultantly, instead of sustainable growth, host States are damaged in the long term either by undermining their public interest or by failing to protect citizenry rights. Despite its claim to support investment facilitation in low-income countries maximizing the benefits of investment and minimizing negative side effects,98 the Action Menu does not make any policy recommendation to prevent race to the bottom. Although the Action Line 9 insists on cooperation between developed and developing countries in capacity building, the Action Menu should have addressed the issue of race to the bottom directly. For example, a sub-line can be added to the Action Line 9 urging developed countries to notify the developing country partners of their conceivable race to the bottom policies, and actively work with them to reformulate such policies. The Action Line 10 requires the maintenance of high standards of corporate governance and responsible business conduct by outward investors.99 Another possibility to address the issue of race to the bottom could be by way of strengthening the corporate social responsibility (CSR) regime in the investors’ home States, and by providing effective remedies for any breaches of CSR by their investors operating in other States. Targeting or investment generation by actively seeking out investors based on national development plans. Several Action Lines in the Action Menu refer to the possible role and benefits of IPAs for investment facilitation. However, the Action Menu does not seem to focus much on the image building side of the IPAs role, which is an important feature of investment facilitation policy. Studies show that low-income countries may get increased inflows of foreign investment from improving the business environment rather than from the investment promotion.104 The success of IPAs more earnestly relies on host States’ image and their overall business environment. The well-known key determinants for a favourable business environment are security, macroeconomic stability based on economic policies, good governance and the rule of law, and well-developed financial and physical infrastructures. Without policy guidelines on image building and good business environment for host States, the Action Menu’s investment facilitation framework is incomplete. The long-term success of a developing country IPA will ultimately be determined by its strategy to achieve non-economic contributions along with economic development through FDI. However, the Action Menu does not emphasise the need for IPAs to synchronise foreign investors’ business expectations with the host States’ development objectives. Although the Action Menu recognises that facilitating investment is crucial for inclusive growth,105 it does not require specific actions to ensure achievement of inclusive growth through FDI. Due to the varied range of inclusive growth objectives,106 it is perhaps not possible to provide precise actions for every aspect of inclusive growth to be achieved through FDI. However, in order to create a better nexus between achievement of inclusive growth through investment facilitation policies, the Action Menu should include a specific action that IPAs should assess specific inclusive growth objectives to be achieved through an admitted FDI and conduct a periodical review and reporting whether those objectives have come through. The UNCTAD’s Global Action Menu for Investment Facilitation is a step in the right direction. At the time when international investment law is fraught with internal antagonism, the Action Menu’s investment facilitation framework brings positive vibes to international investment law and policy making. The Action Menu provides good policy praxis to redirect the development of international investment law to a less adversarial and a more constructive path. It suggests rebuilding of future international investment law and policy with a reconciliatory spirit and by promoting investment facilitation for sustainable development. The host States can benefit from the Action Menu by implementing its Action Lines that ensure transparent and predictable business environment for foreign investors and their investments. The objectives of the Action Menu are clear: it deals with investment facilitation and not promotion although both yield the same results of an open and easy flow of foreign investments. However, UNCTAD must ensure that the Action Menu’s distinction between investment promotion and facilitation is not misconstrued as a covert attempt to achieve the objectives of pre-entry investment treaty model through domestic regulation of FDI. For this purpose, the UNCTAD should include a statement in the Action Menu clarifying that its focus is on the post-entry facilitation only and not on influencing the domestic rules and policies on admission of FDI. The UNCTAD’s Action Menu contains comparable policy recommendations included in similar initiatives by the APEC’s IFAP and the OECD’s PFI. However, although the APEC’s IFAP aims to deal with investment facilitation as a separate policy subject, it conflates promotion with facilitation by suggesting recommendations for all stages of the investment cycle. The OECD’s PFI, on the other hand, provides a clear distinction between investment facilitation and investment promotion. However, the OECD’s PFI provides broad general guidelines instead of the specific policy actions for investment facilitation. The UNCTAD’s Action Menu fills this gap. The Action Menu is, therefore, an important and timely effort because it adds new discourses to foreign investment facilitation policy making. Some of the Action Lines clearly reflect existing policies implemented by States. However, the Action Menu’s objective to detach the agenda of investment facilitation policy in a precise manner from the contested areas of international investment law, such as investor-State arbitration and international minimum standards, will benefit all States including those that have already taken steps in the right direction, as well as those that are lagging far behind. The Action Menu’s triangular approach, i.e., bringing the investors as well as the home and host States together under one umbrella policy, is also very good as the Action Menu effectively provides a one-stop policy guide for all the relevant stakeholders. Likewise, the Menu’s “whole-of-government” approach usefully promotes the sense of concerted administrative activism and much needed collective responsibility on part of a host States’ government agencies and authorities. The triangular and whole-of-government approached will prevent investor-State disputes. It is unrealistic to assume that States would sacrifice national interest for the sake of transparency and predictability. The Action Menu’s policy recommendations should reflect this necessary compromise to give a balanced and more realistic view on expectations of transparency and predictability. The Action Menu should recognise that not all administrative discretion is bad for investment facilitation agenda for sustainable development. It may not be sensible to shorten the screening of all types of investment proposals and such an expectation sounds unreasonable. The Action Menu should be mindful of the fact that most developing and least developed countries are susceptible to hijacking by the all-powerful multinational corporations and may not accept the idea of too much involvement in the domestic law-making processes. Although consultation in this regard is a good practice, it should not be translated into a free licence for a ruthless campaign to implement corporate agenda. A sub-line can be added to the Action Line 9 urging developed countries to notify the developing country partners of their conceivable race to the bottom policies, and actively work with them to reformulate such policies. The Action Menu should include specific policy direction as to how concerted sustainable development agenda can be incorporated within the investment facilitation policy framework. The Action Menu should promote the idea of enforcement of liability in investors’ home States for any harm caused by the investors to sustainable development in host States. The Action Menu should directly address the issue of race to the bottom. The Menu should include policy directions on the protection of public interests that might be challenged by the investment facilitation policies. A sub-line can be added to the Action Line 9 urging developed countries to notify the developing country partners of their conceivable race to the bottom policies, and actively work with them to reformulate such policies. Another possibility to address the issue of race to the bottom could be by way of strengthening the CSR regime in the investors’ home States and by providing effective remedies for any breaches of CSR by their investors operating in other States. The Action Menu’s suggestion for the creation of IPAs is good; however, the Menu should make further recommendations for image building and the creation of a favourable business environment in host States. There should be directions on maintenance of security, macroeconomic stability based on economic policies, good governance and the rule of law in the Action Menu. The Action Menu’s proposals should include assessment by IPAs of both economic and non-economic development objectives of host States as part of investment facilitation policy and reporting mechanism on inclusive growth. See, Charles Brower & Stephan Schill, Is Arbitration a Threat or a Boon to the Legitimacy of International Investment Law?, 9(2) Chicago J Intl L (2009) 471–498; Suzanne A Spears, The Quest for Policy Space in a New Generation of International Investment Agreements, 13(4) J Intl Economic L (2010) 1037–1075; Muthucumaraswamy Sornarajah, A Coming Crisis: Expansionary Trends in Investment Treaty Arbitration, in, Karl P Sauvant (ed) Appeals Mechanism in International Investment Disputes (OUP, Oxford, 2008) 39–45; Ari Afilalo, Meaning Ambiguity and Legitimacy Judicial (Re-)construction of NAFTA Chapter 11, 26(2) North Western J Intl L Business (2005) 279–314, 282; Susan D Franck, The Legitimacy Crisis in Investment Treaty Arbitration: Privatising Public International Law through Inconsistent Derisions, 73(4) Fordham L Rev (2005) 1521–1625, 1523; Ari Afilalo, Towards a Common Law of International Investment: How NAFTA Chapter 11 Panels Should Solve Their Legitimacy Crisis, 17(1) Georgetown Intl Environmental L Rev (2004) 51–96; Charles H Brower II, Structure, Legitimacy, and NAFTA's Investment Chapter, 36(1) Vanderbilt J Transnatl L (2003) 37–94; Charles N Brower, Charles H Brower II & Jeremy K Sharpe, The Coming Crisis in the Global Adjudication System, 19(4) Arbitration Intl (2003) 415–440. Brower & Schill, ibid 473. Bruno Simma, Foreign Investment Arbitration: A Place for Human Rights?, 60(3) Intl Comp L Q (2011) 573–596; Kyla Tienhaara, What You Don’t Know Can Hurt You: Investor-State Disputes and the Protection of the Environment in Developing Countries, 6(4) Global Environmental Politics (2006) 73–100. Brower & Schill, supra note 1, 473. See, for example, Hugo Perezcano, Risks of Selective Approach to Investor-State Arbitration, CIGI Investor State Arbitration Series, Paper No 3 (April 2016). Martin Khor, The World’s Worst Judicial System?, South Bulletin 74 (5 July 2013). The International Convention for the Settlement of Investment Disputes (ICSID Convention) is a “multilateral investment treaty” entered into force on 14 October 1966. See, for example, Jeswald Salacuse & Nicholas Sullivan and Tim Buthe & Helen Milner, in, Karl P Sauvant & Lisa E Sachs (ed) The Effect of Treaties on Foreign Direct Investment – Bilateral Investment Treaties, Double Taxation Treaties, and Investment Flows (OUP, Oxford, 2009) chaps. 5 and 6. See, for example, Eric Neumayer & Laura Spess, Do Bilateral Investment Treaties Increase Foreign Direct Investment to Developing Countries?, 33(10) World Development (2005) 1567–1585. Stephan Schill, The Multilateralization of International Investment Law (CUP, Cambridge, 2009). See, for example, Aniruddha Rajput, The Myth of a Multilateral Framework in International Investment Law, 56(3–4) Indian J Intl L (2016) 427–461. This is believed to be one of the reasons why the OECD MAI negotiations failed. See, for example, Daniel Egan, The Limits of Internationalization: A Neo-Gramscian Analysis of the Multilateral Agreement on Investment, 27(3) Critical Sociology (2001) 74–97. The UNCTAD Global Action Menu for Investment Facilitation, UNCTAD/DIAE (September 2016) (hereinafter the “Action Menu”). See the UNCTAD Policy Hub’s Investment Policy Blog at: http://investmentpolicyhub.unctad.org/Blog (accessed 19 March 2018). The Action Menu, supra note 13, 3. Dirk W Te Velde, Measuring State-Business Relations in Sub-Saharan Africa, Institutions and Pro-Poor Growth (IPPG), Discussion Paper Series Number Four (2006). See also, Investment Promotion and Enterprise Development Bulletin for Asia and the Pacific, No 1, 2003, Economic and Social Commission for Asia and the Pacific (United Nations Publication, Sales No E.03.II.F.36). UNCTAD World Investment Report 2011 – Non-Equity Modes of International Production and Development (Sales No. E.11.II.D.2) 94. Since 2015 the European Commission has been working to establish a Multilateral Investment Court. See <http://trade.ec.europa.eu/doclib/press/index.cfm?id=1608> (accessed 19 March 2018). The recently concluded India-Brazil BIT reportedly does not contain any provision on investor-State arbitration. Instead, it is understood to have provided for a tiered dispute resolution method including the use of an ombudsman, State-State arbitration and procedures for dispute prevention, including the establishment of a joint committee tasked with overseeing the BIT’s future implementation. The text of India-Brazil BIT has not been released but these features appear in Brazil’s Model BIT. For detailed discussion on investment promotion, see, Louis T Wells & Alvin G Wint, Marketing a Country: Promotion as a Tool for Attracting Foreign Investment, Foreign Investment Advisory Service (FIAS) Occasional Paper, vol. 13 (Revised Edition 2000) 1–204. supra note 17, 107. The OECD Policy Framework for Investment User’s Toolkit, infra note 102, has also described investment facilitation as part of investment promotion activities. International Finance Corporation, Global Investment Promotion Best Practices (World Bank, Washington, 2012). Henry Loewendahl, A Framework for FDI Promotion, 10(1) Transnatl Corporations (2001) 1–42, 3. Rudolf Dolzer, Principles of International Investment Law, 2nd edn (OUP, Oxford, 2012) 87–97. Andrew Newcombe & Lluís Paradell, Law and Practice of Investment Treaties: Standards of Treatment (Wolters Kluwer Law & Business, Brussels, 2009)134. Anna Joubin-Bret, Admission and Establishment in the Context of Investment Protection, in, August Reinisch (ed) Standards of Investment Protection (OUP, Oxford, 2008) 12. Howard Mann & Charles Brower, NAFTA's Investment Chapter: Dynamic Laboratory, Failed Experiments, and Lessons for the FTAA (American Society of International Law, Washington DC, 2003). However, no legal obligation on part of the host State arises unless a formal investment contract has been concluded or an investment has been actually made. For discussion on this point, see, supra note 31, 14. The Action Menu, supra note 13, 4. C Rousseau, for example, has defined international minimum standard as ‘a norm of customary international law which governs the treatment of aliens, by providing for a minimum set of principles which States, regardless of their domestic legislation and practices, must respect when dealing with foreign nationals and their property.’ C Rousseau, Droit International Public (Sirey, Paris, 1970) 46. (Cited by OECD Working Papers on International Investment, Fair and Equitable Treatment Standard in International Investment Law (Number 2004/3, September 2004) 8. See, for example, Ahmad Ghouri, Interaction and Conflict of Investment Treaties, Chapter 2 – The Evolution of Investment Treaties (Kluwer Law International, Brussels, 2015). The OECD Working Papers on International Investment, supra note 34, 8. Including bilateral investment treaties (BITs) and investment chapters in free trade agreements (FTAs). Ibid. See also, Martins Paparinskis, The International Minimum Standard and Fair and Equitable Treatment (OUP, Oxford, 2013). See, for example, The OECD Working Papers on International Investment, supra note 34. Karl P Sauvant, The Evolving International Investment Law and Policy Regime: Ways Forward, E15 Task Force on Investment Policy (1 January 2016) 14–18. Brazil is reported to have concluded first series of its Cooperation and Investment Facilitation Agreements (CIFAs) with Mozambique, Angola and Mexico in 2015 and negotiating further CIFAs with Algeria, Chile, Colombia, Morocco, Peru, South Africa and Tunisia. See, Fabio Morosini & Michelle Ratton Sanchez Badin, The Brazilian Agreement on Cooperation and Facilitation of Investments (ACFI): A New Formula for International Investment Agreements?, Investment Treaty Network (4 August 2015). See the Preamble to the Brazil – Mozambique and Brazil – Angola IFCAs (signed in 2015). An unofficial translation of the texts of the Brazil – Mozambique and Brazil –Angola Cooperation and Investment Facilitation Agreement (IFCA) by Martin Dietrich Brauch is available at the official website of the International Institute for Sustainable Development (IISD) <http://www.iisd.org/> (accessed 19 March 2018). Felipe Hees & Pedro Mendonça Cavalcante, Focusing on Investment Facilitation – Is It That Difficult?, Columbia FDI Perspectives (No 202, 19 June 2017). APEC Investment Facilitation Action Plan (IFAP), 2008/MRT/R/004 (31 May 2008) 1. (hereinafter the “APEC’s IFAP”). APEC’s IFAP, ibid, What is investment facilitation? APEC’s IFAC, ibid, Multilateral Investment Facilitation. The Action Menu, supra note 13, Action Lines 7 to 10. UNCTAD’s Action Menu, supra note 13, 4. Policy Framework for Investment (2015 ed, OECD Publishing, 2015). These five proposals have been submitted by Friends of Investment Facilitation for Development (consisting of Argentina, Brazil, Chile, China, Colombia, Hong Kong, China, Kazakhstan, Mexico, Nigeria and Pakistan); MIKTA (consisting of Mexico, Indonesia, Korea, Turkey and Australia); China; Russia; and Argentina and Brazil. South Africa, Uganda and Bolivia are reported to have joined India. The Economic Times (15 May 2017). The statement is available at <https://docs.wto.org/dol2fe/Pages/FE_Search/FE_S_S009-DP.aspx?language=E&CatalogueIdList=240870,240871,240899,240900,240833,240> (accessed 19 March 2018). The Communication from Brazil is available at <https://docs.wto.org/dol2fe/Pages/FE_Search/FE_S_S009-DP.aspx?language=E&CatalogueIdList=241891&CurrentCatalogueIdIndex=0&FullT> (accessed 19 March 2018). For some detailed discussion on the need for foreign direct liability rules, see, for example, Marisa McVey, A powerful Retort: Foreign Direct Liability as an Essential Mechanism of Redress for Victims of Human Rights Violations by Multinational Extractive Corporations (Postgraduate HRC 2015 Working Paper No 1), Human Rights Centre, Queens University Belfast. See, for example, Yann Duval, Trade and Investment Linkages and Policy Coordination: Lessons from Case Studies in Asian Developing Countries, Session 1.2: Trade Policy, OECD Global Forum on International Investment, Global Forum VII (27–28 March 2008) 4. See, for example, Policy Framework for Investment: A Review of Good Practices (OECD, 2006), Public Governance, Chapter 10, 238. Tom Christensen & Per Lægreid, The Whole-of-Government Approach to Public Sector Reform, 67(6) Public Administration R (November– December 2007) 1059–1066. See, for example, the UNCTAD Action Menu, supra note 13, Action Line 4. See, for example, the UNCTAD Action Menu, supra note 13, Action Line 7. See, for example, the UNCTAD Action Menu, supra note 13, Action Lines 3 and 5. See, for example, the UNCTAD Action Menu, supra note 13, Action Lines 1, 5 and 8 to 10. See, for example, the UNCTAD Action Menu, supra note 13, Action Line 3. Policy Framework for Investment (OECD Publishing, 2015), 3. UNCTAD World Investment Report 2016 – Investor Nationality: Policy Challenges (UNCTAD/WIR/2016), 106. See for the details <http://www3.bkpm.go.id/> (accessed 18 March 2018). World Investment Report 2016, supra note 70. See for the details <http://invest.gov.kz/pages/one-stop-shop-for-investors#> (accessed 18 March 2018). See for the details <http://www.invest.gov.tr/en-US/Pages/Home.aspx> (accessed 18 March 2018). See <https://oicci.org/index.php/news/interactive-session-of-the-oicci-managing-committee-with-the-prime-minister-of-pakistan-mr-shahid-khaqan-abbasi/>accessed 18 March 2018). See also, supra notes 20, 41 and 42. See <http://www.waipa.org/> (accessed 18 March 2018). See, for example, Vivienne Bath, Foreign Investment, the National Interest and National Security – Foreign Direct Investment in Australia and China, 34(5) Sydney L Rev (2012) 5–34. The detailed and regularly updated document on Australia’s foreign investment policy can be found here <https://firb.gov.au/resources/policy-documents/> (accessed 18 March 2018). See, for example, Andrew Lumsden, The “National Interest Test” and Australian Foreign Investment Laws, The Centre for Law, Markets and Regulation – University of New South Wales, Australia (2016) <https://clmr.unsw.edu.au/article/market-conduct-regulation/state-capital/the-%E2%80%9Cnational-interest-test%E2%80%9D-and-australian-foreign-investment-laws>. The Action Menu, supra note 13, Action Line 3, sub-line 1. See, for example, Tamasin Cave & Andy Rowell, The Truth about Lobbying: 10 Ways Big Business Controls Government, The Guardian (12 March 2014). The UN 2030 Agenda for Sustainable Development repeatedly emphasises on the need for more FDI to achieve sustainable development goals (SDGs). The UN 2030 Agenda is available at: <https://sustainabledevelopment.un.org/post2015/transformingourworld>(accessed 15 May 2018). See also the presentation on Investment Facilitation by James Zhan as UNCTAD’s Perspective, available at <http://investmentpolicyhub.unctad.org/Upload/Documents/JamesZhan_PresentationOnInvestmentFacilitation.30-9-2016.pdf> (accessed 18 March 2018). As it has been showcased in the UNCED Agenda 21 of the Rio Declaration on Environment and Development, Adopted by the UNCED at Rio de Janeiro, UN Doc A/CONF (13 June 1992). 151 /26 (Vol. 1) (1992); ILM 874, 1992 (Rio). See, for example, William W Olney, A Race to the Bottom? Employment Protection and Foreign Direct Investment, 91(2) J Intl Economics (2013) 191–203; Pasquale Pazienza, The Relationship between FDI and the Natural Environment (Springer Briefs in Economics, 2014) 27–35. Rajeev D Mathur, Investment Facilitation and Regulation in Developing Countries, Briefing Paper No 3 (2005), 3 <http://www.cuts-ccier.org/pdf/Investment_Facilitation_and_Regulation_in_Developing_Countries.pdf> (accessed 19 March 2018). Judith M Dean, Mary E Lovely, & Hua Wang, Are Foreign Investors Attracted to Weak Environmental Regulations? Evaluating the Evidence from China (2005) Economics Faculty Scholarship, Paper 88, 1. Studies have found the environmental decline in the Export Processing Zones (EPZs). For details, see, Kevin R Gray, Foreign Direct Investment and Environmental Impacts – Is the Debate Over?, 11(3) Rev European Community & Intl Environmental L (2002) 306–313, 309; Krishna V Vadlamannati & Haider A Khan, Race to the Top or Race to the Bottom? Competing for Investment Proposals in Special Economic Zones (SEZs): Evidence from Indian States 1998–2010 (2011) <http://www.uni-heidelberg.de/md/awi/professuren/intwipol/top_bottom.pdf> (accessed 18 March 2018). For details, see, Katharina Holzinger & Thomas Sommerer, “Race to the Bottom” or “Race to Brussels”? Environmental Competition in Europe, 49(2) J Common Market Studies (2011) 315–339, 317. See, generally, Bruno Gurtner & John Christensen, The Race to The Bottom: Incentives for New Investment? Tax Justice Network (2008) <http://www.taxjustice.net/cms/upload/pdf/Bruno-John_0810_Tax_Comp.pdf> (accessed 19 March 2018). Jing-Lin Jing-Lin Duanmu, A Race to Lower Standards? Labor Standards and Location Choice of Outward FDI from the BRIC Countries, 23(3) Intl Business R (2014) 620–634. The Action Menu, supra note 13, Action Line 10. See, Torfinn Harding & Beata S Javorcik, Roll Out the Red Carpet and They Will Come: Investment Promotion and FDI Inflows, 121(557) Economic J (December 2011) 1445–1476. See, Sarah B Danzman, Leveraging WIAPA to Facilitate Private Sector Linkages, World Association of Investment Promotion Agencies (WAIPA) Research Note Series (April 2017). OECD Policy Framework for Investment User’s Toolkit, Chapter 2, Investment Promotion and Facilitation, 6 <http://www.oecd.org/investment/toolkit/policyareas/investmentpromotionfacilitation/41246119.pdf> (accessed 19 March 2018). DW Te Velde, Measuring State-Business Relations in Sub-Saharan Africa, Improving Institutions Pro-Poor Growth (IPPG) Discussion Paper, No 4 (Manchester 2006), 8 <https://assets.publishing.service.gov.uk/media/57a08c51ed915d3cfd0012ec/IPPGDP4.pdf> (accessed 19 March 2018). Jaques Morisset & Kelly Andrews-Johnson, The Effectiveness of Promotion Agencies at Attracting Foreign Direct Investment, Foreign Investment Advisory Service Occasional Paper, No 16, World Bank, Washington, DC (2001), 12–14 <https://openknowledge.worldbank.org/bitstream/handle/10986/15073/271500PAPER0Ef1f0promotion0agencies.pdf?sequence=1> (accessed 19 March 2018). See, for example, What Is “Inclusive Growth”?, CAFOD Discussion Paper (Full Version) (August 2014).